I have a new chow chow puppy, who is just over 8 weeks old. I have been trying to socialize him as much as possible, but he is scared of new people. Has anyone had this issue before? Yes, Cocoa was an extremely shy puppy. I took her everywhere when she was little and always had treats for people to give her. If she was on the ground she would try to run away from people approaching her so I would pick her up and have them offer her treats and give her scritches. It took patience and consistency but she is now a confident girl and although still a little wary of strangers she is for the most part a happy outgoing girl. At 8 weeks old, she most likely just separated from her litter, so everything is new to her. If she has been separated any longer, then she didn't get enough maturation time. Slowly introduce her to new situations and people. She will get more confident with each outing. Make sure to mix it up...young children, teens, older folks, big dogs, little dogs, etc. With people spend the time to instruct them how to meet your dog for the 1st time. Many Chows are head shy and have limited peripheral vision. Show them to approach from the front and below the chin. 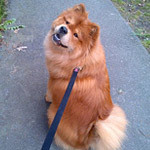 It's a great opportunity for both your pup and for you to educate the public on meeting a Chow for the 1st time. Visit the local Petco or Petsmart, or the dog park once vaccinations are in order. Thank you for the advice, we will start putting it to use! He needs to be socialized. Take him every where you can with you so that he is around different people. He will learn to get along with others. It is something that should have been started earlier, but obviously the previous owner did not do that. So it is now your job to show him that people are okay and to not be afraid of them.